Photo: Dr. Gulzar Singh Cheema an Indian-born Canadian physician and politician. Cheema was a member of the Legislative Assembly of Manitoba from 1988 to 1993 and a member of the Legislative Assembly of British Columbia from 2001 to 2004,making him one of only a few Canadian politicians to sit in two provincial legislatures since Confederation. 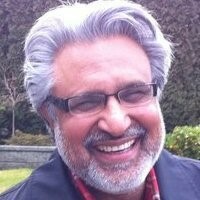 He is the first Indian born to be elected MLA in Canada. Indo-Canadians or Indian-Canadians are Canadian citizens whose heritage fully or partially belongs to any of the many ethnic groups of the India. The terms East Indian and South Asian are sometimes used to distinguish people of ancestral origin from India in order to avoid confusion with the First Nations of Canada. East Indian Canadians are significantly more likely than the Canadian average to have a university degree, and most Indians in Canada are socio-economically middle class and affluent. In 2001, 24% of seniors of East Indian origin lived with relatives, such as the family of a son or daughter, while only 5% of all seniors in Canada lived with relatives. According to Statistics Canada, Indo-Canadians are one of the fastest growing communities in Canada, making up the second largest non-European ethnic group in the country after Chinese Canadians. The highest concentrations of Indo-Canadians are found in the provinces of Ontario and British Columbia, followed by growing communities in Alberta and Quebec as well, with the majority of them being foreign-born. Source publication: RCMP/CFS (Canadian) STR frequency web site www.csfs.ca/databases.